Not a lot has been happening in the past 6 months in The Establishment. Now that both Encore/Embassy and Members Only are closed, we guess they thought it would be a good idea for an official re-launch. 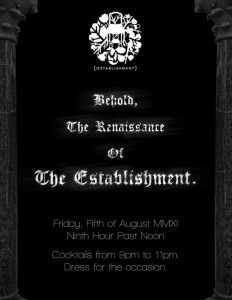 They call it “The Renaissance of The Establishment” and it’s happening on Friday August 5 2011 (see flyer below). Saturdays: Mode Prive Saturday with DJs Alex Pain and JC Sandejas & Opening DJs Carlo, Nampu and Pat Po. The Establishment will also feature hot Model bartenders Alexandra Santos and Janelle Olafson. I have seen some of the promotors calling The Establishment “Opus of The Fort”, although we don’t agree with that, it’s definitely a really nice lounge/club and I hope the re-launch will be a big success and that The Establishment will become another exclusive hot spot in Manila nightlife. The Establishment Manila is located at The Fort Strip in Bonifacio Global City (The Fort).